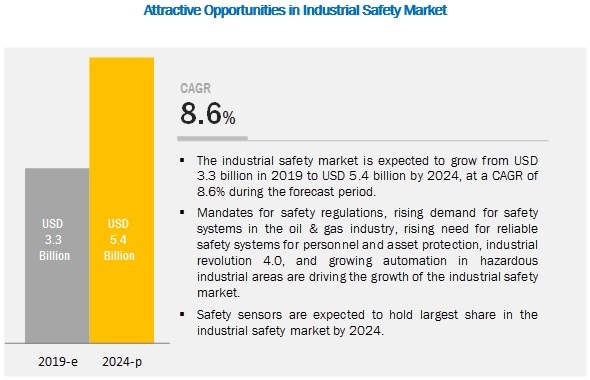 The Industrial Safety Market is expected to grow from USD 3.3 billion in 2019 to USD 5.4 billion by 2024, at a CAGR of 8.6% during the forecast period. The market’s growth is propelled by the mandates for safety regulations, rising demand for safety systems in the oil & gas industry, rising need for reliable safety systems for personnel and asset protection, industrial revolution 4.0, and growing automation in hazardous industrial areas. The industrial safety market for programmable safety systems is expected to grow at the highest CAGR during the forecast period. Programmable safety systems such as safety PLCs are an integral part of safety instrumented systems. Safety PLCs need to be certified with IEC 61508—the industrial safety standard for electrical/electronics/programmable electronics safety-related systems. Unlike regular PLCs, a safety PLC, along with logic solver, has redundancy and other safety diagnostics that ensure successful execution of required safety instructions. The emergency shutdown systems market is expected to grow at the highest CAGR during the forecast period. An emergency shutdown (ESD) system is designed to avert hazardous situations; it can initiate the shutdown of a plant, unit, or equipment (sensors are used to detect undesired conditions and logic solvers respond to sensors by taking final elements like valves and pumps to safe states). During an emergency, an ESD system shuts down the process in a safe and orderly manner. Various parameters are considered while implementing an ESD system, such as cost-effectiveness of the system, compliance with current government rules and regulations, and litigation costs that may occur in case of the absence of an ESD system. The power generation industry is expected to grow at the highest CAGR from 2019 to 2024. Power generation plants pose high risks to human lives as well as the environment. Therefore, a high level of industrial safety is required for such plants. Industrial safety systems such as burner management, fire & gas monitoring, and emergency shutdown systems are widely used in power plants. Fire & gas monitoring solutions are especially deployed in power plants and substations to address applicable laws and regulations. A BMS (Burner Management System) protects boilers from exploding by ensuring safe and orderly operating sequences during start-ups and shutdowns. The industrial safety market in APAC is expected to grow at the highest CAGR during the forecast period. This growth will likely be driven by the increasing industrialization in emerging economies such as China and India. These 2 countries have already adopted industrial safety in various industries such as oil & gas and power generation. The adoption of safety automation solutions in the manufacturing industries in this region is increasing significantly with rapid industrialization, thereby contributing to market growth. Don’t miss out on business opportunities in Industrial Safety Market. Speak to our analyst and gain crucial industry insights that will help your business grow.